MediMatic offers a vendor neutral ECG workflow solution for your cardiology department, providing a fully automated digital workflow. Through a bi-directional integration with the HIS/EMR system, ComPACS facilitates worklist distribution, archiving, review, analysis and reporting, enabling ECG reports to be automatically available in the hospital’s electronic patient record. Integration with the Hospital Order Entry system will provide Modality Worklist distribution to the electrocardiograph, allowing the operator to easily set up and start the case. 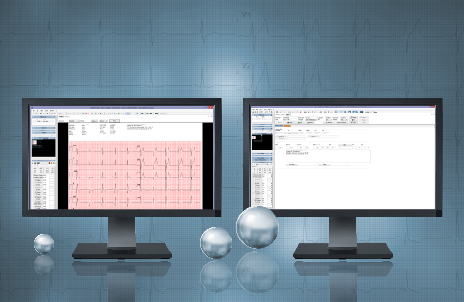 The ECG curve, typically 12 leads and 10 seconds in length for a resting ECG, is easily captured during the procedure by the click on a button and securely stored to the ComPACS archive. Various parameters measured automatically by the electrocardiograph, are also stored as alphanumeric data as part of the ECG file, and will automatically populate the ECG report. The cart’s automatically generated interpretation will also be stored as part of the ECG file, and populate the ECG report. After the procedure, the physician can review, analyze and report the ECG, all in ComPACS. There are several ECG post-processing tools available in ComPACS, such as: choosing between 6+6, 6+3 or Cabrera display formats, display either Original or Derived sequences, and also modify the sweep speed of presentation between 50 mm/sec and 25 mm/sec. The ECG tracing can be zoomed to a desired level and panned to the region of interest. Re-measuring of various parameters is available using the off-line ECG analysis tool. Measurement trends over time can be easily accessed. Using the ECG structured reporting tool enables confirmed and electronically signed reports to be automatically routed directly to the HIS/EMR, making the ECG report generated in ComPACS directly available in the electronic patient journal as a document. Streamlines workflow by enabling physicians to view, complete and sign ECG reports from the hospital, office or home.